Hunter 99111 Wireless fan remote/receiver: lights flashing. I installed the fan and remote per the instructions. All worked as expected for about 2 weeks when all of a sudden the lights started to flash on and off in a consistent steady pattern like a car blinker. All light related buttons on the remote were functionless. The fan itself and the fan related buttons on the remote operated as expected with no issues. I replaced the light bulbs with new 40W LED bulbs which did not fix the issue. I read in a online support form that a common reason for flashing lights is a faulty wattage regulator within the light kit of the fan. So I bypassed it which did not fix the issue. I then noticed that the wireless receiver was humming in unison with the flashing lights. The humming was present regardless of if the lights were on or off via the pull chain. So I replaced the wireless receiver re-paired the fan and remote and BOOM! LIGHTS work as expected… YAY! NOT!…. 1 week later lights are flashing once again…. I once again tried bypassing the wattage regulator which did not fix the issue. I double and triple checked all my wiring and ensured each connection is tight. For testing, I wired the fan directly to the power source without the receiver/remote and the fan lights work as expected. 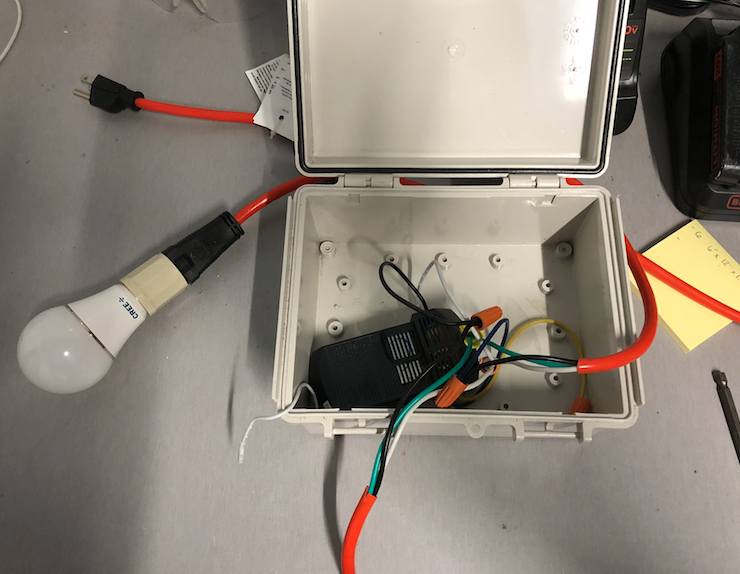 I wired the remote to and external lamp with a spliced extension cord and plugged it into the wall outlet and it worked fine for two weeks in my garage. Then I tried it in the room where the fan is, in the wall outlet and it worked fine for 4-5 hours then started flashing…. Could there be an issue with the wiring of my home circuit causing the receiver to flash the lights? I have two other fans in other rooms on the same circuit that work as expected with the same remote (older model). What mechanism in the remote/receiver causes the flashing of the lights? I’m hoping the 99111 is just a POS and it's not some messed up circuitry in my house…. I’ve gone through 3 of these 99111 and they all end up flashing. Hunter support is absolutely no help at all so Im asking fellow peers for help. Any input is much appreciated. It would be easy at this point to say that the Hunter wall remote/receiver was bad, but this has now happened 3 times with the same results. 3. You aren't using fully dimmable and compatible LED light bulbs. I say that because you shouldn't have 3 separate components of the Hunter 99111 go faulty UNLESS you didn't replace the receiver in all 3 occasions, if you did then we can continue to look at those 3 factors I mentioned above. I would say that the simplest solution would be to change out the light bulbs (even just for troublshooting) for ones that are fully dimmable. While I can't tell on the Hunter 99111 model, but it may not be compatible with some or most dimmable LED bulbs. If that is the case, then opt for filament based light bulbs that are completely dimmable, such as halogen or incandescents. While you can check the wiring, or more importantly already did, you can opt for using a multimeter on the fan itself to ensure you are getting the proper voltage and Ohms. If it isn't, then the fan itself would be the issue at stake. In fact, beyond the light bulbs, you've troubleshooted everything but the fan replacement, which is a possibility where the issue lies. For starters, switch out the light bulbs to fully dimmable light bulbs, like incandescent or halogen bulbs in an A15 shape, and see what happens there. After 3 tries and having the same results from this remote/receiver unit, the culprit to me sounds like its the bulbs or the fan itself. If all connections are working properly without the receiver unit being installed, then the issue lies within the fan itself. And if that is the case, it's simpler to replace the ceiling fan itself and then use fully dimmable LED or other light bulbs that are compatible with your wall control and receiver. I've replaced the bulbs, did not fix issue. For testing the fan: I wired the fan directly to the power source without the remote/receiver and the fan lights have been working fine for 3 weeks. So I don't think its the fan. For testing the remote/receiver:I've wired the remote/receiver into an extension code with a lamp on the end (see below photo). When this device is in my garage it works fine no problems. When I plug it into an outlet in the room where the fan is... The lights flash after 5-12 hours. This makes me thing one of two things. 1) This Hunter 99111 and the other 3 of them I've used are defective or 2) there is something wrong with the circuity of my house. Im guessing at this point 2 is more likely. But my question is, what mechanism causes the hunter 99111 to go into flashing mode. I have another fan with the same remote (Older model) on the same circuit that shows no issues. Well you certainly have troubleshooted this very thoroughly! Besides using another receiver/remote combination, the next step is exactly as you said, checking the existing circuit it is on to make sure everything is connected for proper continuity and voltage. Since I haven't seen the Hunter Remote 99111 in my store, I'm not as familiar with it versus the other versions by it and our in-house brands. That's not to say that another version can work in this situation given the repeated failures of the fan. With this information, you're at a crossroads as to what your next step would be. If the fan is indeed working as you say from your test box, then you'll either need a new receiver/remote and/or check the wiring leading up to the fan on that circuit. Of course, work safe and keep us updated on your progress.